The Kawai GM Series are rare and elegant baby grand pianos that are built with true dedication to detail and quality. That is exactly what you can expect from Kawai, a company with a history that goes back over 80 years. It began with Koichi Kawai, a skilled builder who put up a small workshop in Hamamatsu, Japan. Koichi Kawai dedicated himself to mastering the delicate art of piano craftsmanship. His traditional working methods are still being used today at the Shigeru Kawai Research and Development Laboratory by Master Piano Artisans who apply his techniques using highly advanced tools to create high performance instruments of great beauty. Kawai offers several piano lines, which include the EX Concert Piano, the RX BLAK Series Grand Pianos, and the GE and GM Series Grand Pianos. The Kawai GM Series has two different models in its line. The first model is the GM-10K Baby Grand Piano, a classic instrument that exudes elegance and regal charm. This finely crafted instrument will produce a resonant tone upon playing, that will create a truly delightful ambiance. Although the GM-10K is a compact 150cm in length, it is built with the same dedication to quality craftsmanship that goes into the production of the GE and RX Series pianos. 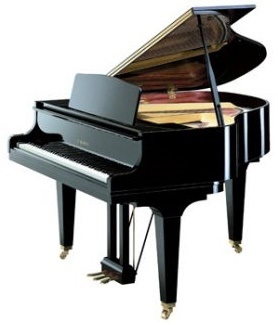 The result is a majestic baby grand piano that is impressive enough to suit any home or studio. However, if you are looking for an even more impressive instrument, then you may find it in the Kawai GM-12 Baby Grand Piano. Like the GM-10K, this is a petite instrument that offers a responsiveness and playability comparable to that of Kawai's larger pianos. The GM-12 design features the extraordinary Millennium III Advanced Piano Action using ABS-Carbon action parts. This makes for optimum speed and responsiveness in piano touch. You will be captivated by the incredibly discerning degree of control it gives you. This is made possible with the use of ABS-Carbon, a composite material of highly impressive rigidity and sturdiness, enabling Kawai to build action parts that are light and speedy without sacrificing durability. The Kawai GM Series pianos are outfitted with steel reinforced keyslips that resist warping and bending. The GM Series piano keybeds are constructed using sturdy laminated hardwoods that are reinforced with an underside steel support beam. You know that you are getting instruments of exceptional grace and quality in the case of Kawai GM Series Grand Pianos. Looking to Purchase a Kawai GM Series Piano? Tell us more about your search and we'll help you to find what you're looking for.